What would you do if you met someone you thought just might be one of Jesus original disciples still living in the 21st Century? That's Jake's dilemma as he meets a man who talks of Jesus as if he had known him, and whose way of living challenges everything Jake had previously known. 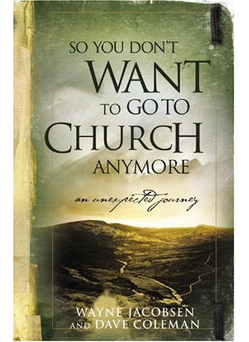 So You Don t Want to Go To Church Anymore is Jake s compelling journal that chronicles thirteen conversations with his newfound friend over a four-year period and how those exchanges turn Jake's world upside-down. With his help, Jake faces his darkest fears, struggles through brutal circumstances and comes out on the other side in the joy and freedom he always dreamed was possible. If you're tired of just going through the motions of Christianity and want to mine the depths of what it really means to live deeply in Christ, you'll find Jake s story will give you hope for your own. This book probes the difficult questions and offers some far-reaching answers. It just might turn your world upside-down as well. Set Free to Live Free!